Pricing Your Oregon City Rental | Real Property Management Classic in West Linn OR. The trusted leader for professional property management services. The most common question we receive is “How much can I get for my rental?”. As with any investment, the gross yield is critically important. Following are several important considerations when pricing your rental property. One of the first determinants is the season of the year. The rental market is seasonal in this area with the spring and summer months seeing by far the greatest amount of activity. There may also be a bump in activity right at year end – but be prepared for greater inventory and longer days on market in those shoulder seasons of late fall and winter. Rental prices may dip $50 to $100 per month for homes being rented in off months such as November or January. If you do enter a lease during those months consider either contracting or extending the initial term so it expires in the busier season. 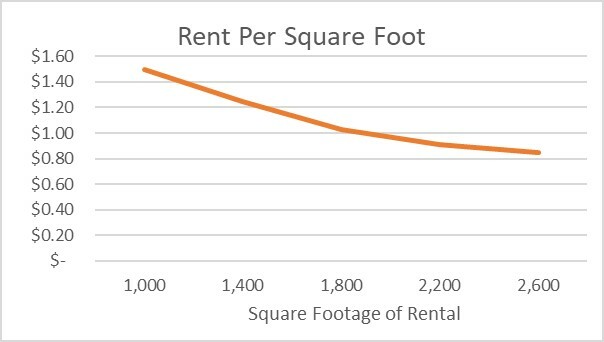 Within the industry rental pricing is often converted to dollars per square foot. Zillow is one of my favorite rental platforms as it shows both the days on market and price per square foot for all listings. An analysis of rental pricing quickly illustrates the trend – the larger the rental, the lower the rental price per square foot. The chart shows a typical trendline. The primary drivers behind this trend are the diminishing utility of additional space and the reduction in qualified applicants as the home (and its price tag) grow in size. More on this below. Rentals in the 800-1,200 square foot range are often found priced between $1.40 and $1.60 per square foot while rentals exceeding 2,000 square feet may be priced closer to 80 cents per square. Comparable properties for rent are a great help in determining pricing. When reviewing comps, pay close attention to the days on market and total inventory of those properties. If there are 10 similar properties that have been on the market for an extended period, their true rental pricing is likely less than advertised. Our software allows us to see currently rented properties and those prices paint a slightly different picture than what you may see advertised. A common application requirement is gross income of 3x the rental price. The higher the rent, the higher the income requirement. As rents approach and exceed $2,000 per month, the number of potential applicants begins to drop quickly. A monthly rental of $2,000 requires $72,000 in gross income – which is the 60th percentile of household income in the Portland area – leaving only 40% of households as potential tenants. On a side note, 60% – 70% of tenants have pets. If the rental does not allow pets, then the pool of potential applicants in the example above will drop from 40% of households to 12%-16% of households. The pool can shrink very quickly! Our best advice is to review the comps on the market and adjust based upon current inventory and time of year. We recommend pricing aggressively to get it rented as quickly as possible. Sitting vacant for even a few extra weeks often more than negates the additional rent brought in by a higher price. We have software programs that can assist with pricing your Oregon City rental – feel free to ask us to run them for you (there is no charge for this service and we can quickly email them to you).